Firstly I really wanted to share a friend's company, The Workbench. Unless you've been living in a wifi-less ditch (zone 4?) you'll have spotted these guys running evening prosecco fuelled ring making classes around London. Essentially you carve your own wax ring over bubbles with friends (with the careful guidance of their team) and a couple of weeks later your creation arrives in the post. It's a brilliant idea for birthdays, hen dos and catch ups. Brilliant idea. Gus bought me a ticket last year and together we made our own, unique ring for my pinky finger. Find tickets and dates here. Due to demand they've also created The Box which allows you to make it from home too. Order one here, and then follow the dummy-proof videos on their website. I intend to spend a day carving mine between Christmas and New Year (lieu days that no-one really knows what to do with, right?). Perfect presents for people who already have everything, or have a creative streak they rarely get to show off. 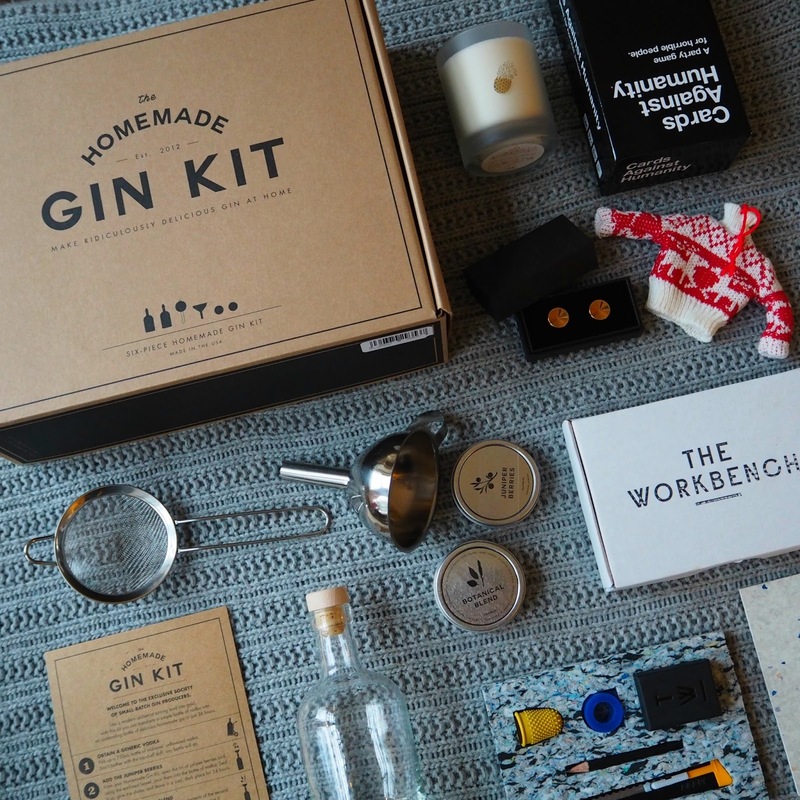 In the same vein I also found the Homemade Gin Kit on Amara's site from Men's Society. Aside from being wildly sexist (give me a woman who wouldn't enjoy their own limitless supply of gin during these cold months?) this present is an excellent idea. Gus and I are actually going to make a bottle in advance and take our own gin to each of our parents' for Christmas. You can flavour as you'd like (we googled the ingredients of our favourite gins to get the balance right) and it comes with the majority of bits and pieces you need. Just add tonic. On the subject of vastly-more-successful-than-me friends, do make sure you check out Kelly's collaboration with Auree jewellery where all profits (note all profits) go to Rangers With Tusk to help the fight for Africa's elephants. Maasai based designs, beautifully delicate and easy to wear - find them here. Similarly, Rosie's collection has massively taken off this year; I love it all but out of everything this is my favourite piece. Last but not least if you have a tricky man to buy for please do check out Alice Made This. I had already bought Gus a pair of gold cufflinks above and then realised I was standing next to one of the founders at a party. Such a lovely man, he was incredibly humble about the success of the company. Their stuff is simple without being boring, slick without being overtly "fashion." In other words its an excellent punt-present for any guy (actually saying that I'd happily wear it all myself). Check them out at Mr Porter here. Now for a bit of colour. I've already told you about Lizzie's pouches but here's a link incase you need it. Sticking with bags, unless you've been living in wifi-less cave you'll know Manu Atelier is the brand to have right now. Sticking with the festive theme here is a gold one, but the classics are the tan and black versions. They ain't cheap but neither should they be as a shed load of quality and craftsmanship goes into them. Gus if you are reading this click here and purchase - thank you muchly. Beauty wise, I could go on for days but here goes; Eisenberg has been an excellent all-round discovery this year. Their stuff works. The Creme Contour is a favourite but to be honest it's all good. If you're buying for someone who is looking to fight for youth, make it a little bit easier for them with something from these guys. Try them out at Urban Retreat at Harrods if you're around town! Next up something I was given for my birthday; Kiehl's Turmeric and Cranberry mask. If you're looking to maintain the glow during these winter months get yourself one of these. As a warning do wash the sink out afterwards because it goes everywhere, but you'll look so good its worth the tidy up. 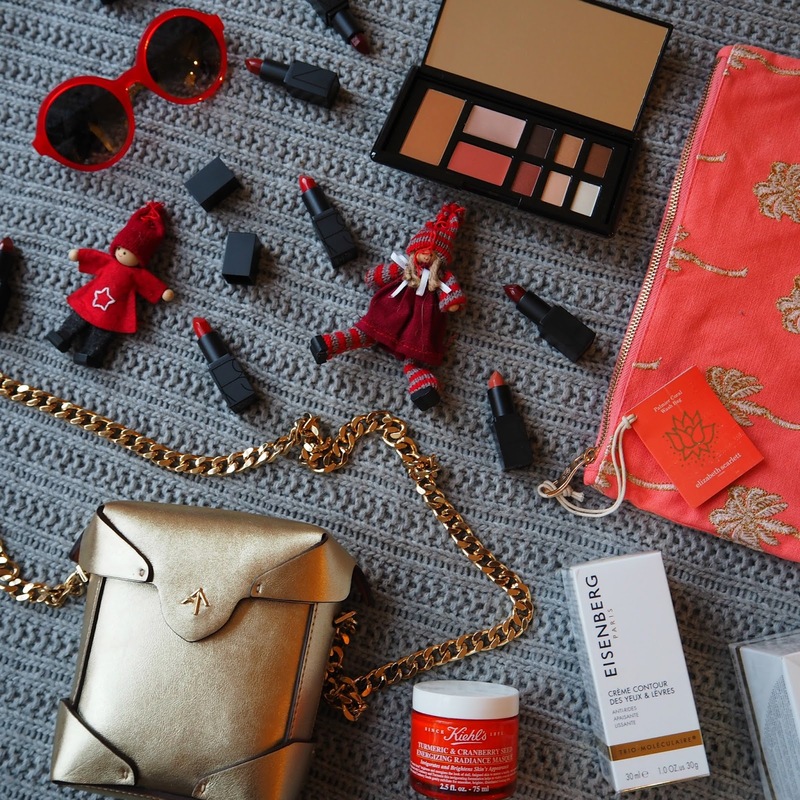 As for make up the NARS lipstick set is awesome value, and all of the colours are their best sellers. I had a field day playing around with these, a great mix for all skin tones too. The Sarah and Betty shades are my personal favourites... Ooh and an excellent frugal find: Rosie for Autograph's eyeshadow palettes here. When this arrived I was dubious but it's really rather good and outdoes the other sets I was sent to review, ten times over. Really good day time shades and then equally good night time colours. It's the kind of thing you can keep in your handbag all the time and it'll see you through every last minute crisis! Before I go, lets not forget the idea of gifting sunglasses. As it's cold in the UK eyewear often gets overlooked and then come summer you suddenly need a new pair. Besides the obvious Ray-Ban aviators and Jimmy Choo Andies, I've found Kate Spade's collection to be really, really good. I especially love these ones (which I wore in my Instagram here). Hope this all helps!